It is a great joy for us brothers to be together with you here in Hong Kong for this new stage of the pilgrimage of trust on earth in Asia. Some of you have traveled a long way to come here, from fifty countries in Asia and other continents. I would like to express my joy with this verse from the Bible: “This is the day that the Lord has made, a day of gladness and a day of joy.” Yes, we have been waiting for this day for a long time. At Taizé, we are a small community of about a hundred brothers from different Churches who have made a life-commitment to follow Christ together. For several months, an international team of brothers and volunteers has been preparing this moment and here we are: thank you and welcome to all! Our meeting is a pilgrimage of trust and reconciliation. In Asia, there is a great tradition of pilgrimages. But what is a pilgrimage? It is an activity by which we go beyond what we already know, to come closer to God and to renew our communion with him. It is also an activity to come closer to others and to create with them a relationship of trust. For several decades now, our community of Taizé has established bonds of friendship with Asian Christians in many different countries. With China and Hong Kong, deep bonds unite us. In 1977, Brother Roger, who began our community in Taizé, spent several weeks in a poor neighborhood of Hong Kong. With a few brothers and young adults, he stayed in a dilapidated hut on stilts, in the middle of a population that lived isolated in junks on the shores of the south China Sea. That long visit had marked him deeply, and he wanted brothers of the community to extend it by remaining in Hong Kong for several years. Subsequently, the entry into the community of a Chinese brother from Hong Kong made him very happy, and he encouraged him to make all the visits he could to his home country. The Church in China often lives with limited resources. And yet, what a dynamic faith there is among these Christians! We admire their perseverance and their faithfulness. As a sign of friendship and gratitude to the Christians of China, our community printed a million Bibles in 2009 and distributed them in all parts of the country. We are happy to welcome young Chinese at Taizé, for a few days or a longer time, among the young people who come there from all continents. And every Friday night, with the many young people who take part in our daily prayer, we pray for the Christians of China. In Hong Kong, the meeting was prepared in close collaboration with the Churches and local Christian communities. We would like to thank the Christian leaders, the civil authorities, and the volunteers for their commitment. The hospitality we have received in this city touches us particularly. These days, families and elderly persons are opening the door of their homes to welcome us. What a beautiful sign of trust! As you know, the program of our meeting will include various opportunities for sharing and exchange. We will also participate in the life of the local Churches. Every afternoon and evening, we will meet here for a time of common prayer together. I would like to say a few more words about this. A saying of Jesus helps us understand the meaning of this prayer: “Where two or three are gathered together in my name, I am in their midst.” And so, at each common prayer, it is Christ who brings us together and unites us beyond all our differences. As we did tonight, we are going to sing together these days in different languages. The words come from the Bible or from believers who have gone before us. When we sing, I believe that an inner door opens, a personal relationship with God, while the communion between all of us grows. At each common prayer we will also hear and meditate on some verses of the Word of God. In silence, we will be able to let these words descend deeply into our hearts. Even when there are so many of us, silence allows us to be alone before God. It is then a question of turning to him, not first of all to ask him something, but to give a sign of openness, to recognize his presence which is beyond us and yet which touches us. He is the one who, before speaking to us, welcomes us, unconditionally, with infinite respect for our freedom; he is the one who comes towards us in prayer. Although we may have the impression that God does not answer our requests, we discover, during long silences where apparently nothing happens, or long afterwards, that he is at work in us. Through the Holy Spirit, he visits us and enlightens us. These days, we will meet together to pray, and to prepare ourselves to be bearers of peace, trust and reconciliation, in the places where we live, where God has put us. I wish you all a beautiful meeting in Hong Kong. Since yesterday, our meeting in Hong Kong has marked by the hospitality of so many people of good will. In a city where the pace of life is so rapid, sometimes frantic, where people are so busy, we are touched that those who welcome us take the time to receive us and share their life with us for a few days. For many young people in Asia and elsewhere, there is social or family pressure for efficiency and success. Sometimes from a very young age, children or teenagers work a lot and live in the stress of competition with others. Although living something demanding can be important in a person’s formation, we must take care not to forget that the essential does not lie in the quest for success. If the pressure becomes so great that there is no more room in life for free time and activity, for stopping and returning to the essential, for contemplation, what future are we preparing? In so many young adults around the world we see frustration or discouragement today. Indeed, after many years of schooling and study, it is often hard to find a good job, and one’s personal future remains uncertain. Given the great challenges of our time, there can also be discouragement. World news is often difficult. In many places, war or violence seem to be at the forefront. This reminds me of an impressive meeting I had a few years ago during a three-week stay in China. One of the most powerful testimonies we heard over there was given to us by an 80-year-old Protestant pastor. He went through a long period, 27 years, of suffering and exile. Even in the difficulties we encounter in the world and in the frailness of our lives, will we be attentive to the signs of hope around us? I would like to describe briefly a few of them. In Asia and in many countries of the world, it seems to me that a thirst for an inner life is manifesting itself, and attentiveness to a spiritual life is being reborn. This is a sign of hope that impels us to deepen our own trust in God, so that we can communicate it to those around us. I also see, in the different civilizations of Asia, an almost natural sense of worship. Regardless of their religion, in prayer people spontaneously have an attitude of respect towards the hereafter. A sense of inwardness is perhaps more accessible here than elsewhere—a respect for the miracle of life, for creation, an attentiveness to mystery. Every summer, in Taizé, young adults from every continent come for two or three months of volunteering. Some stay with us for a year. In meeting them, in sharing with them, I see how many of them unite prayer and solidarity. Finally, in the younger generation, everywhere in the world, attention is also paid to the environment, care for creation and sustainable development. This is also very good news for the future of this wonderful planet on which we live. Starting from the passage of Matthew’s call by Jesus, there will also be this question, which is very personal: “How can I welcome the trust Jesus places in me?” It will be a good opportunity to share with others about this question of commitment. May these days in Hong Kong make us acutely attentive to the sufferings of those around us and to the great challenges of today’s world, but may this gathering also root us in the hope that God goes with us and opens for us a path and a future. Yesterday evening, I described a number of challenges we face today and also many reasons for hope. I would now like to say a few words about the specific role that Christians could play concerning these signs of the times. The first contribution of Christians can be increased attention to the world around us. We can read in the Gospel how Jesus himself was constantly interacting, in dialogue. Like his disciples, he invites us to pay close attention to those around us, especially to those who are suffering. Whether poverty is material, spiritual or psychological, solidarity should always mean, first and foremost, respecting the human dignity of others. This implies sharing that is reciprocal: the discovery that, by providing help, we are often the ones who receive. This reciprocity seems to me central in living out solidarity, and the whole Gospel makes us aware of it. We need each other, those who seem strong and those who seem weak, to become more human. In this reciprocity, inner peace and joy in living can be renewed. When I say this, I am thinking for example of some of my brothers living in Bangladesh. For nearly forty years they have shared the lives of the poorest and most abandoned. They also conduct pilgrimages for young people with disabilities, which bring together believers of different religions. Another contribution of Christians could be to increase awareness that we all belong to the same human family. Conflicts—between individuals or between peoples, between believers of different religions and even between Christians—can inflict wounds that do not heal for a long time. It is true that there is fear of others, of strangers, and we all experience this. Yet we do not find a solution to this fear by isolating ourselves behind walls, but only by seeking an encounter with what is unknown. Throughout his life, Jesus was not afraid to enter into dialogue with people who were very different from him. How do we adopt this attitude of profound openness that we see at work in the life of Jesus? First of all, I believe that it is through a flourishing inner life that we can receive others without fear in their difference, their otherness, in a benevolent trust. To cause fraternity and friendship to grow requires respecting others in their difference. This is true for interreligious dialogue as well. It also includes, without a doubt, an element of pain, because the treasures of my faith cannot be fully received and shared by the others. What is for me the source of a deep joy can even remain inaccessible to them. Even with these mysterious limits, we are always called to love and respect others as they are. A few weeks ago, we welcomed at Taizé a group of about thirty Buddhist monks and nuns from Korea. Their religious tradition has developed a wisdom that commands admiration. Practicing compassion, consenting to life, refusing evil: these are values that we share with them. It was a very good visit that allowed us once again to have this experience: while being very different, we have so much to receive from one another. When one is firmly rooted in one’s own faith, there is nothing to fear from genuine interreligious dialogue. Tonight, like yesterday night, the prayer will now continue around the cross. This is a prayer we have every Friday in Taizé. We will lay the cross on the floor and everyone can come and put his or her forehead on the wood of the cross. This Friday evening prayer allows us to carry in our prayer all those who are undergoing trials in their existence: those who suffer in their souls or in their bodies, those who have had to leave their country, the victims of injustices of all kinds, those who experience loneliness. By his life, his death and his resurrection, Christ has opened for each and every one of us a road to life. Tonight we can pray especially for our families and loved ones, for those who are experiencing hardships. And we also pray for our respective countries. May the comforting Holy Spirit be a presence of hope. This evening, our pilgrimage of trust on earth in Hong Kong is nearing its end. Once again, I would like to express our gratitude to the people who welcomed us here, to the church leaders and the civil authorities, to the volunteers who prepared this meeting. To all of you, thank you very much! In this vast Asian continent, in most countries Christians are a minority among the other religious traditions. The words of Christ to his disciples “you are the salt of the earth” then make perfect sense. The Asian continent is rich in its diversity, its multi-millennial religious traditions, and the richness of its cultures as well. It is good to remind ourselves, as Christians, that the gospel is there not to abolish this heritage but to fulfill it. How is this possible? The Gospel is for us a source of freedom. It enables us to overcome barriers; it encourages us to move forward. 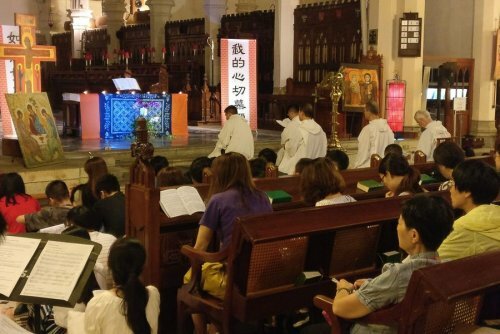 In this sense, young Asian Christians have a great contribution to make to the universal Church. To all of you who are attempting to live out your faith here or elsewhere in Asia, I would like to highlight some of the great gifts that you can transmit: the freshness of the faith, the value of dialogue between different cultures and religions, the simplicity of a presence of the Church at the service of the poorest. We see, in many places in the world, how many people are working very concretely for peace and reconciliation. Could Christians all ask themselves: how can we too become peacemakers, nearby and far away, in solidarity with our respective countries? In Taizé, we follow with great attention the recent news coming from Korea. Some of our brothers have been living in Seoul for nearly forty years. With our brother Han-Yol, who comes from Korea, they understand from within the aspiration of the Korean people for peace and reconciliation. May the process of rapprochement between the leaders of the South and the North continue in the coming months! As we return to the places where we normally live, there are other prayer intentions that we could all bring with us. Every Friday in Taizé, we pray for the Chinese people and for Christians in this great country—we will continue to do so in the coming months. Let us carry very concrete intentions in our personal prayer! This will help us to root our relationship to God in our daily lives. At the end of these days in Hong Kong, each one of us can ask themselves personally: back home, where is God waiting for me? Faith is a gift that continually becomes deeper, through personal prayer, Bible reading and sharing, through intense moments of pilgrimage or times of retreat. No doubt this is the best way to root our lives to a greater extent in the joy of the Risen Christ, to witness to it to those around us with boldness and humility, and to become involved in the Church and for others. To open these paths of peace and trust, Christians have a specific gift. The communion of the Church, the deep love that can unite those who follow Christ, is a unique ferment of peace in the human family. It is the communion between us, Christians of different denominations, that gives credibility to the Gospel. In a world where violence sometimes seems to gain the upper hand, by our communion we can offer a sign that shines out even in the most difficult situations. At the end of our meeting, I would like to stress the importance of unity among Christians, within our different Churches and among our Churches. During these days we have had a wonderful experience of unity. But this unity can never be taken for granted. We must always begin again to live in mutual forgiveness. When we turn together to Christ, when we are “under one roof” as often as possible, he already unites us. Humbly, in prayer, we always learn that we belong to one another. More than ever before, today we have the opportunity to live a communion beyond the borders of peoples, cultures and generations. And through this communion, we discover that we are never alone any longer. I would like to express to you tonight this message of hope: with your faith and your doubts, your aspirations and your questions, you are not alone. All over the world, young people are sharing this faith journey. Together we are united in this great communion of the Church. In this way, incorporated into the great human family, we can help prepare a future of peace on earth. God gives us his breath, his Spirit, so that we may be witnesses to peace by the lives we live.